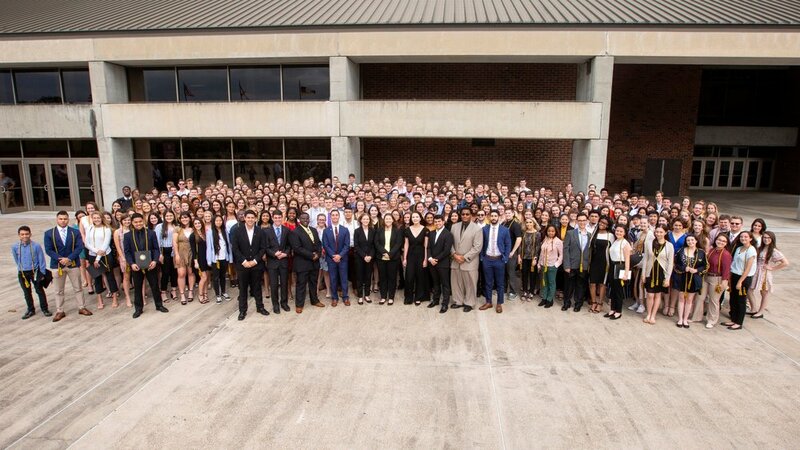 The 64th annual Phi Eta Sigma National Honor Society induction ceremony was held on Sunday, March 31st at the Donald L. Tucker Civic Center. The oldest and largest national honor society welcomed new members who have achieved academic excellence during their first year in college. Before the ceremony, all guests and new inductees were invited to enjoy the food, desserts, and refreshments. Executive board and committee chair members welcomed and mingled with the new inductees. Cindy Chamides, a native of Miami, FL, gained interest in joining Phi Eta Sigma after receiving flyers and spotting PES tabling at Market Wednesday. “I asked them questions at Market Wednesday and they encouraged me to join. I am excited to get more involved and meet new people,” said Chamides. From Daytona Beach, FL, majoring in biology, Chase Benezette introduced himself at the induction’s Leadership and Involvement table and expressed how honored he felt to be invited into such a prestigious honor society. “I like how PES is an active honor society on campus and I plan on getting more involved,” said Benezette as he signed up to receive PES’s weekly emails. Another inductee, Xian Lyn, and his mother walked up to the Leadership and Involvement table inquiring about the leadership council committees. Lyn’s mother conveyed how proud she was of Xian and offered her support to PES. “I am one of those moms willing to help with anything,” said Lyn’s mother. To begin the ceremony, President Brittany Stevens greeted the crowd and Vice President Caven Hamilton introduced the guest speakers. Guest Speakers at the event included: Associate Dean of Undergraduate Studies and Director of the Honors Program, Dr. Annette Schwabe and Dean of Undergraduate Studies at Florida State University, Karen Laughlin. Scholarship nominees, excellence in service awards, and undergraduate research awards were also recognized during the ceremony. All new inductees were corded with a black and gold honor cord. This honor cord should be worn during commencement day to represent PES and all their academic achievements. Following the ceremony, all new inductees were invited to take a group picture outside the Civic Center.